It was an Independence day - India quiz contest being conducted many years ago. This question got passed and came to our team. If Kaziranga was for Rhinos, Corbett for tigers what was Agumbe for ? That was the first time I had heard of 'Agumbe '. Perhaps the quizzer's logic told me to take that wild guess (endangered- wild- life - kannada-sounding name-western- ghats) or perhaps because I felt like I had a subconscious connection to this place and them, I replied... ‘snakes’ and quickly corrected myself and said ‘cobras’. The quiz master nodded and our team got the points. That is what brought us here many years later. Agumbe is a small town located on a plateau above a steep hill on the Western Ghats. Since those bonus points from the quiz, a visit to Agumbe has been playing on my subconscious mind. 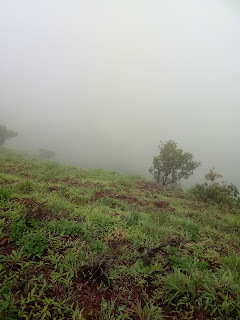 A Google search familiarized us with Agumbe. Agumbe is known as the Cherrapunji of the south. Agumbe is where the king cobra research institute is located. Agumbe is where the rain forest research station is located. None of this would have appealed to us in its entirety but for that last bit of trivia that dived us down a nostalgic trip of our childhood days. Get ready for the Time Travel across Agumbe. If you have the ability to listen to the sound track click on this link and continue to read the post. Trust me you will time travel. Conditions apply : You must be an Indian and more than 30 years old. Agumbe was the location where ‘Malgudi days’ was shot. The cherry on the cake – Doddamane was the house where ‘Malgudi days’ was shot. Thanks to tripadvisor that is where we planned to stay when at Agumbe. Ah to reminisce those childhood days watching R K Narayan’s – Swami and his friends on Doordarshan, the only available channel on national television would send anyone born before the mid-eighties into a nostalgia trip. Our host confirms to us that Malgudi days was shot in this house. The house is about 130 years old. Made of stone walls and carved with doors and pillars of strong forest teak / timber wood, I find striking similarities with my grandfather’s house in Mangudi … agaramangudi. It is not just the house and its ancient architecture that has been precisely preserved. At the backyard there are huge copper pots in which hot water in boiled through a wood fired boiler system. The ceilings are low and supported by beams made of teak wood. When we are shown to our rooms we observe the intricately carved ancient teak wood dresser with a mirror. The rooms overlooking the central courtyard are long (pretty inefficient use of space by today’s standards) and the staircase leading to it is made of stone and is steep. Doddamane was built long before electricity came into this country and therefore you see traces of electric wires pulled over for the light bulbs and table fans that were added on much later to the house. If you peep into the dingy cob web laden store room besides the stair case on the first floor, you glimpse into a bygone era when wealth was measured not by what you could draw from your bank account but by what you could draw from the nature’s bounty that surrounded you. In Malnad (rain forest land in local language) surrounded by dense forests wild life must have been abundant. King cobras were revered. Every house had a ‘Sarpa Kavvu’ a shrine to worship the snakes that were displaced to make way for the house, in its court yard. A deer horn carelessly dumped into the dingy space peeps out of the iron grill of the store room window. At some point this must have been its hunter’s pride possession. Huge pillars of teak, timber and sandalwood lay casually stacked up to give way for sturdier pillars to reconstruct the house. Kasturi akka welcomes us and her granddaughter shows us to our room. She also shows us around the house and lets us know where the bathroom and the toilets are. And there comes the realization of what we have signed up for. Like in most homes that were functional almost a century ago, when the luxury of ceramic toilet bowls and electricity were not yet discovered, one did not fathom the concept of attached bathrooms leave alone a western toilet. Up until about 40-50 years ago people used dug up mud pits in the outhouse, which they covered with a bucket full of soil after the job was done. A small narrow lane that opened to the side of the house was for the night soil workers, who came along and picked up the matter covered in the soil and kept the pits clean for the next morning. The night soil workers were usually untouchables from a lower caste and did all the dirty jobs that no one else would sign up to do. Women, when they menstruated stayed in a corner room, perhaps besides the cattle shed where they would get a break from the daily chores while other women who were not menstruating went about picking up the daily chores. Three days later, the woman, after her menstrual periods were over would wash up all her clothes that she used during the periods and take a full dip at the river, pond or tank whichever was the closest water body situated behind the house to purify herself before she entered the household. That perhaps explain the term ‘muzhukame irukka’; loosely translated as 'she has not been dipping herself in the river and bathing’ signifying that the woman has skipped her periods and was pregnant. In the more recent generations the rules were relaxed and the restrictions only applied to the menstruating women’s entry into the room which was the shrine of the house where the figurines of gods and goddesses were kept and into the kitchen where food was cooked. They moved along in the rest of the house freely. Kasturi Akka understands that the strict rules of the generations gone by cannot be applied in these modern times. Ever since they started welcoming tourists into their homestay she knew she had to relax some of these conditions. Doddamane serves pure vegetarian food. Alcohol and meat are strictly prohibited. Guests freely move about the house except into the sanctum sanctorum where the shrine of gods and goddesses are worshipped daily by the family. Years ago, soon after Kasturi Akka had started letting tourists stay at Doddamane a king cobra emerged in her shrine from nowhere. Far from killing or chasing away the intruder that could have killed many a family member with its deadly venom, Kasturi Akka’s family surrendered to the messenger of the gods and begged for forgiveness. They prayed and conducted purifying rituals at Doddamane. Since then the entry into that room – the shrine of gods is prohibited for the home stay visitors. The rest of the house is freely available for the visitors to move around and have a look. Kasturi Akka is in the kitchen preparing for dinner. She summons her granddaughter to light the lamp and do the evening pooja rituals in the shrine as the evening sun sets. It is that time of the evening as the sun sets down after leaving its traces of dense orange blush across the grey sky. It is that time of the evening when the cows come home (In the literal Indian sense) and settle into the cattle shed. It is that time of the evening when the woman of the household lights the lamp besides the tulsi plant in her backyard. ‘Shubham karauti’ , ‘Sandhya Vandanam’ ‘ ‘Sandhya aarti ‘ and the various names of that quaint ritual conducted in Hindu households every evening as the sun downs signifying the end of yet another day. Thanks’s giving is a daily ritual in this country. That is when conch shells are blown, temple bells are rung, lamps are lit, and camphor and incense sticks are burnt. That is the time when the entire family gathers up in prayer for thanking the powers to be for yet another day gone peacefully. .. It feels peaceful, watching from the courtyard, the granddaughter lighting the lamp, reciting the evening hymns and doing the pooja ritual. A strong smell of sandalwood incense wafts through the courtyard. It is that time of the evening when we would be logging into a call with colleagues in the East coast. .
Did I say Thanks giving is a daily ritual in this country? I stand corrected; Thanks giving is a daily ritual in the countryside. Suddenly we feel a sense of gratitude and are thankful for the thanksgiving weekend. It is few minutes before 8.00 pm, the designated dinner time at Doddamane. Outside the house on the road, the street dogs are barking. Looks like there is a territory war going on and one has intruded into their territory. We are sitting opposite to each other leaning on the timber wood pillars and the main entrance of the house while watching the street dogs barking, chatting up while we are also chasing away the mosquitoes buzzing around us. We talk about the rustic title music of the television serial Malgudi days ( remember thandane thane nane naa …) that was shot in this house in 1986, now almost more than 30 years back. It was a story written by R K Narayan, reminiscicing the life of a bygone era that was almost 40 years earlier to the time it was televised. We think time moves slowly in places like this. The sun has set, it is pitch dark, we are back from our evening walk and we have pretty much nothing to do. Very soon we would realize how wrong we were. That is when our host comes by and gives us the Wi-Fi password. Kasturi-Akka summons us and says the dinner is ready. In Doddamane it is still a wood fired stove in which the food is cooked. A Gas stove and an electric induction stove are seen outside the kitchen, But by the looks of it, they look like they are seldom used. We wash our hands and sit on the table where banana leaves are laid out. About three or four members of the household both men and women take turns and serve us our food on the leaves. We are not great fans of Mangalorean food. And there is a good reason to it. In those days when we began our careers in Mumbai , we would regularly eat our late night dinners at the ‘Shetty joint’ . The Mumbai restaurant business was a monopoly of the Shetty’s from the Udipi region. The temple town of Udipi is very close to from this place. Food had a predictable taste and wherever you went out to dine in Mumbai, you would experience the same taste, flavour and looks of the food that was dished out in a ‘Shetty’ restaurant. We used to call it the Mcdonaldization of south Indian food. And how we hated it !!!. The evening before, when we ate at the restaurant in the town of Udipi, our taste buds cried out loud and reminded us of our overdose of late night ‘Shetty food ‘during our overworked days in Mumbai. Even that over boiled milky tea tasted exactly like how it tasted in the college hostel all those years ago which too was managed by a 'Shetty' contractor. If consistency reminded you of McDonalds and Subway, dear Indian, think again. Don’t you think the Udupi restaurants mastered it before anyone else? Ah... that was a digression. Back in Doddamane, we lunged into our dinner leaves With trepidation of ‘Shetty’ food looming large in our memories. We were taken in for surprise. Oh yes ! there were coconuts scraped into every dish, there was sweet jaggery and spicy red chillies paste ground into most of them. And yet they tasted different. There was brown rice and a variety of other dishes laid out for us. We were not used to that heavy a dinner. Very soon we realized we had worried unnecessarily. Despite multiple helpings, the palate was so light on our stomachs and so invigorating to the taste buds that we had to agree that there was more to Mangalorean cuisine that just ‘Shetty’ food. Over the last few decades before economic liberalization came into India, young boys driven by poverty or perhaps the lure of city lives migrated from Malnad region onto cities like Bombay and Poona to work as cooks, cleaners and servers in ‘Udupi restaurants’ owned by fellow Mangaloreans.. They learnt the tricks and trade of food business and moved up the value chain. Over the years Udupi restaurants mushroomed all over the country like the way McDonald opened up burger outlets in America and then the rest of the world. The overworked boys put in their sweat and toil along with their pent up frustrations and on-going oppression into the food that they cooked and served. While they all had standard ingredients very similar to what Kasturi Akka’s kitchen served, what they lacked was the love and the warmth of fresh ingredient from Mother Nature in the food. Perhaps that is what made all the difference. ‘A woman’s touch makes all the difference in the food’, I say. After some minor argument we agree that it has nothing to do with gender. Anything produced in mass scale, with only monetary profit in mind, by way of standard methods and procedures by an overworked and unhappy labour force shows up in the form of lack of quality over a period of time. The theory applies to ‘Udupi restaurants’ but can be extended anywhere and to anything. Detour over… back to Doddamane. The Dinner at Doddamane was as authentic as it could get. Full marks to Kasturi Akka’s Malnad (vegetarian) cuisine. .
Kasturi Akka lives with her invalid mother-in-law, her daughter, son-in-law and grand daughter in Doddamane. Doddamane was built by her late husband’s great grandfather and they reckon it is approximately 130 years old. Her father- in-law was the landlord of about eight villages surrounding this area and they had lands that cultivated paddy and Arecanut. In 1957 when the land act came into force all the land that was farmed by the farmers was taken away and they were left only with the house that they could call their own. In his hey days her father- in- law built schools and dispensaries in Agumbe just about 200 meters from Doddamane. Her uncle was a civil engineer and paved the roads that connected Agumbe to the plains across the mountains and the Ghats. She recalls the days when the mountains had mud roads and they would have bullock carts that brought people from the plains to Agumbe. Agumbe, which was known as the ‘Cherrapunji’ of the south. She puts it to afforestation which has resulted in the drastic decrease of forest cover and therefore rainfall in this region. The Rain forest research station and the King cobra research institute was established in Agumbe in 2005. Through the eighties, around the time the television serail 'Malgudi days' was shot at Doddamane, many students of botany would be hosted at Doddamane, while they went about doing their research on the flora and fauna of Malnad region. Ever since the King cobra conservation institute was established the Cobras and other species of snakes started coming into the main village where human beings lived. Over a period of time the cobra population was decimated. The venom extracted from poisonous snakes fetches good money, since it is used to prepare antidotes for snake bites and shipped in small vials the world over. A government subsidized research institute that should have ideally protected the king cobra population seems to have served exactly the opposite purpose. Human greed and motives of profit have driven many a species of plants and animals to extinction. Perhaps Agumbe’s king cobras were just another set of victims. We finish dinner and the granddaughter of the house asks us if we would want to join her at the Venugopalaswamy temple that is about a 100 meters away from Doddamane. Aware that we have overeaten for our dinner, we thought a walk to the temple would be a good idea. Vengopalaswamy temple , apparently is about 800 years old, The frills of modernity have come about this temple, thanks to patronage of the native non-residents of Agumbe that have migrated to bigger cities away from Malnad. This evening there are about a dozen people at the temple. A man is holding the palanquin of the statue of Lord Sri Krishna on his head and they are about to circumambulate the temple. People from the neighbourhood gather as soon as they hear the sounds of the bells and the procession begins. The granddaughter at Doddamane whom we accompanied to the temple leads the procession and sings a couple of ‘Purandara Vithala’ compositions in praise of Lord Krishna in a loud, clear and firm voice. We are in awe of her. She is a college student, pretty contemporary in her way of dressing, with a decent command over English and her confidence levels. Yet she is firmly entrenched in her roots and tradition. Venugopalaswamy – the reigning diety of the neighbourhood is the ‘ishtadevata’ of the families around Agumbe. They perform daily pooja rituals at the temple. The temple has clearly seen much more pomp and splendour in it’s hey days when the families were firmly entrenched in the prosperity that came from cultivating the land around Agumbe. With many absentee residents having migrated to big cities in search of their living, the upkeep of the temple is now relegated to a few members of the neighbourhood who have stayed behind and keep up the daily rituals and the upkeep of the temple. The strangest part about Doddamane is that they do not specify any charges for the home stay. In accordance to the age old tradition, you pay what you can afford, when you leave the place. The hospitality is unassuming yet amazing. They leave you to yourself when you need it and look after you to the extent that you need to be looked after. Kasturi Akka tells everybody who comes there to consider this not as a homestay but as their own grandmother’s house. And true to that tradition she gives you a ‘Kashayam’ – concoction of Ayurvedic herbs that acts as a soothing medicine as well as an invigorating drink. The travel weary drivers that we were, Kasturi Akka’s Kashayam was an instant antidote to the headache and fatigue that was troubling us. Do look up the recipe for Kasturi Akka’s kashayam on this link on Youtube. It would not be fair if we did not tell you the inconveniences at Doddamane. This is a place for heritage travellers, nature lovers and those that do not seek much of comforts and can adjust with very basic facilities. For starters there are no attached toilets. Especially if you have to pee in the night, you have to put on decent clothes, navigate down steep set of stairs and go down into the courtyard where the members of the house are sleeping and then to the kitchen area where you open the door to the backyard before you can use the bathrooms. There are Indian as well as western style toilets fitted with taps. No toilet tissue paper here because scrubbing a paper down your soiled bottom is an insult to Goddess Saraswathi the goddess of learning. This is in keeping with the Indian tradition apart from being environmentally unfriendly. Bathrooms and toilets are clean, however you need to fetch your own bucket of water to bathe from the big copper drums from the adjacent boiler room. There could be mosquitoes and if there are fellow travellers in the room adjacent to you, that are noisy, it may not be very comfortable for you to sleep. If everyone followed the basic etiquette it would not be a problem. That said, if you can adjust to these minor irritants, Doddamane takes you down to an era 30-40 years earlier and can help you experience life of the days you might have had at your grandparents place when you were a child. Preserving a way of living like that despite the onslaught of modernity takes a lot of will power and commitment and that is what Doddamane is striving to achieve.